The natural rate of unemployment is a combination of frictional, structural, and surplus unemployment. Even a healthy economy will have this level of unemployment because workers are always coming and going, looking for better jobs. This jobless status, until they find that new job, is the natural rate of unemployment. The Federal Reserve estimates this rate to be between 4.5 percent and 5 percent. Both fiscal and monetary policymakers use that rate as the goal of full employment. They use 2 percent as the target inflation rate. They also consider the ideal gross domestic product growth rate to be between 2 percent and 3 percent. They must try to balance these three goals when setting interest rates. The Fed encourages Congress to consider all three goals when setting tax rates or spending levels. Frictional Unemployment – Some workers are in between jobs. Examples are new graduates looking for their first job. Others are workers who move to a new town without lining up another position. Some people quit abruptly, knowing they'll get a better job shortly. Still, others might decide to leave the workforce for personal reasons such as retirement, pregnancy, or sickness. They drop out of the labor force. When they return and start looking again, the BEA counts them as unemployed. Structural Unemployment – As the economy evolves, there is an unavoidable mismatch between workers' job skills and employers' needs. It happens when workers are displaced by technology, as when robots take over manufacturing jobs. It also occurs when factories move to cheaper locations. That's what happened after the North American Free Trade Agreement was signed. When baby boomers reached their 30s and had fewer children, there was less need for daycare workers. Structural unemployment remains until workers receive new training. Surplus Unemployment – This occurs whenever the government intervenes with minimum wage laws or wage/price controls. It can also happen with unions. Why? Employers must pay the mandated wage while keeping within their payroll budget. The only way to do this is to let some workers go. It's the consequence of an unfunded mandate. Also, there are six dangerous of types of unemployment. They are cyclical, long-term, real, seasonal, classical, and underemployment. The only way an economy could have a zero percent unemployment rate is if it is severely overheated. Even then, wages would probably rise before unemployment fell to absolute zero. The United States has never experienced zero unemployment. The lowest rate was 2.5 percent in May and June 1953. It occurred because the economy overheated during the Korean War. When this bubble burst, it kicked off the recession of 1953. The financial crisis of 2008 wiped out a staggering 8.3 million jobs. The unemployment rate rose from 4.7 percent to 10.1 percent at its peak in 2009. This considerable loss meant that many of the unemployed stayed that way for six months or more. Long-term unemployment made it even more difficult for them to get back to work. Their skills and experience became outdated, leading to structural unemployment. Does this mean that the recession would leave, as its legacy, a higher natural rate of unemployment? Research done by the Cleveland Federal Reserve said yes, this could be the case. That's because job turnover slowed. Throughout the recession, those with jobs were less likely to leave them. In fact, by 2011, the separation rate was as low as it was during the boom before the recession. The reasons were different though. During the boom, people didn't leave jobs because they liked them and received good wages. Employers had a difficult time finding new employees, so they made sure the workers were happy. 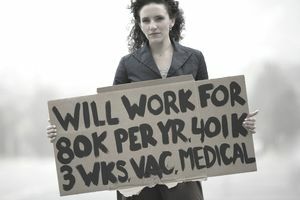 During the recession, workers were afraid to leave and look for better employment. They put up with long hours and no raises to keep their jobs. The natural rate of unemployment typically rises after a recession. Frictional unemployment increases since workers can finally quit their jobs, confident they can find a better one now that the recession is over. Structural unemployment rises when workers have been unemployed for so long their skills no longer match the needs of businesses. Between 2009 and 2012, the natural rate of unemployment rose from 4.9 percent to 5.5 percent. That was higher than during the recession itself. Researchers grew concerned that the length and depth of the recession meant the natural rate would remain elevated. But by 2014, it had fallen to 4.8 percent.